Diamandis, Peter H. and Steven Kotler. 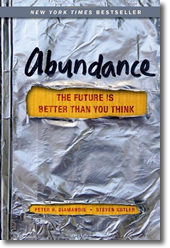 Abundance : the future is better than you think. Free Press, 2012. In any large family, you see a variety of social attitudes, political opinions and perspectives about the future. In my own family, some of the young men are buying guns and stockpiling food, so they will be ready in case of a terrorist attack or environmental collapse. Fortunately, the man who shares my home is far more optimistic. A new book, Abundance, is written for optimists like him. Diamandis and Kotler describe the forces that are driving positive changes in our world. First is the exponential change of technological advancement. In addition, innovation has become democratized and DIY inventors are revolutionizing science fields from robotics to renewable energy. Also, billionaires turned philanthropists like Bill Gates are investing their fortunes and management skills in solutions to third world problems, improving access to health care and education. And lastly, the market power of the developing world is itself bringing about positive change. If the Mayans are wrong and we make it through next week, I recommend this book to end your year with hope. As the academic year closes, this is my last book review of 2012. Students, good luck on your final exams. I wish a happy holiday and years of abundance for 2013 and beyond. Ford Library is pleased to announce the addition of two new data set subscriptions to our Wharton Research Data Services (WRDS) platform portfolio. AuditAnalytics : Audit and Compliance provides detailed audit information on over 1,200 accounting firms and 15,000 publicly registered companies. Know auditing details and fees paid for specific services. Create reports by auditor, fees, location, and industry. KLD Research and Analytics : Social Ratings (Full) from MSCI (formerly KLD Research & Analytics, Inc.) is a provider of company and industry social research data. To meet the needs of social investors, KLD provides research, benchmarks, compliance, and consulting services analogous to those provided by financial research service firms. The historical Social Ratings (Full) on WRDS are a companion product to the Global Socrates web site which contains current text reports and data on company and industry social performance. Christensen, Clayton M. , James Allworth, and Karen Dillon. How will you measure your life? Harper Business, 2012. 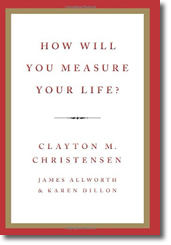 Knowing your job in the family is one of the insights in Clayton Christensen’s best-selling new book, How Will You Measure Your Life? Christensen uses examples from some of the world’s best companies to provide life lessons to students. He explains the theories from his course at the Harvard Business School, Building and Sustaining a Successful Enterprise, and he shows how to apply them to the careers and personal lives of graduates. Readers are encouraged to consider what is likely to happen as a result of different decisions and actions, so they may improve their interpersonal relationships, personal integrity and opportunities for career success. Early in the book, Christensen discusses the two factor theory of motivation, including hygiene factors and motivation factors. People love their work when they are key members of a team that is doing meaningful work; they have an opportunity to learn new skills; and they receive increasingly more responsibility. Yet graduating MBA’s routinely accept positions based on the highest salary offer. In addition, graduates may form mental strategies for what they want in business and in life, but they fail to allocate resources to execute them. High achieving people often unconsciously allocate resources that yield immediate results, such as a promotion or a bonus, but underinvest in activities with a long-term focus, such as raising children. As a result, instead of being a source of immense satisfaction, their children are often strangers. Through his research on innovation, Christensen developed a theory about marketing and product development, “the job to be done.” What causes a consumer to buy a product or service can be thought of as a hiring decision – the consumer hires a product to do a certain job. Companies that develop products that help consumers do a job perfectly are rewarded with loyal customers. Likewise, spouses or partners are hired to do a job in the family. Partners who understand what their job is and who devote time and effort to doing the job reliably are rewarded with happiness at home. This thought provoking book is recommended for all readers.